A promised £200 million rail investment between the north-east and central belt would only speed up journey times by two minutes. The shocking revelation was made by Transport Scotland bosses was made three years after the cash was awarded in a city region deal in 2016. At the signing in January of that year, the Scottish Government pledged to invest the sum within ten years to reduce the travel time by around 20 minutes. Then infrastructure secretary Keith Brown said the cash injection would involve “infrastructure improvements, double tracking at key pinch points and other opportunities to improve journey times to the central belt and on to London”. He said that together they would be “providing an economic boost to the cities and communities of the north- east”. Yesterday, however, Transport Scotland’s head of rail Bill Reeve spoke to the city deal committee where he revealed the much touted improvements around Montrose Basin have been found to offer little or no time benefits. 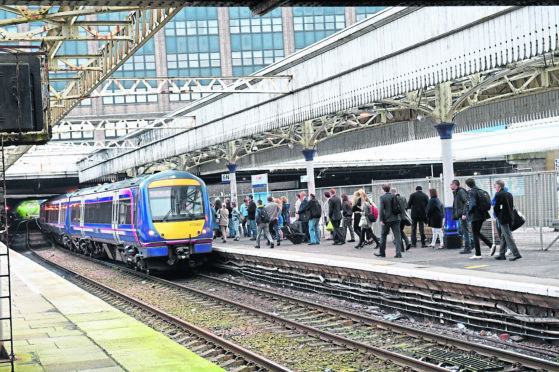 A heavyweight report by the body has found a £218 million investment would trim just 90 to 150 seconds from journeys between Aberdeen and Glasgow and Edinburgh. Mr Reeve claimed a “revolution in rail” expected by next year would reduce journey times, pointing to new high speed (refurbished) intercity trains and improvements elsewhere in the country. However, he could not say exactly what the long awaited city deal money would now actually be used for, nor when it would be spent as he faced a grilling from the committee. A dissenting voice came from Aberdeenshire SNP councillor Richard Thomson, who said they did not expect the sum to be spent on “one big whizz bang project” and welcomed the investment elsewhere. Aberdeen City Council co-leader Douglas Lumsden asked Mr Reeve if by the end of 2026 – the timescale for the city deal – the money would have been spent. He added: “We are working through this study and making progress and in the meantime we are working towards this (journey times) objective anyway. “In terms of real improvements between Aberdeen and the central belt, I can’t recall a bigger step change then you are about to get over the next 12 months. Last night north-east Conservative MSP Liam Kerr said he would be speaking in parliament on the subject. He added: “It is looking increasingly like SNP Ministers simply plucked this number out of thin air. Gordon Casely is a freelance journalist who runs his own firm, Herald Strategy Ltd. He specialises in rail and infrastructure. “When a report involving a rail investment of £200 million runs to a thumping 75 pages, I’d expect encouraging outcomes…pointers to enhanced travel, or a vision of shaping our rail system for the better. “Or even – to quote the mantra endlessly trotted out by Transport Scotland – how we’re ‘going to build the best railway Scotland’s ever had’. “Yet the sole outcome I glean from this heavyweight study from Transport Scotland is that train times from Aberdeen to the Central Belt could have two minutes shaved off existing schedules. “The report opens so encouragingly, with the aspiration that for £200 million we passengers could have 20 minutes slashed off our journeys. “The actuality is the thuddingly clunking TWO MINUTES. That’s right: all that lies at the bottom of Santa’s sack is 120 seconds. “Something’s very wrong somewhere. If £200 million can only save two minutes, then evidently our existing infrastructure can’t accommodate speed-ups. By extension therefore, it’s the infrastructure that’s at fault. “Our European cousins inherited exactly the same Victorian-era rail systems as we did. “Unlike us, they’ve modernised, upgraded and invested. High-speed trains running on the tightest headways connect cities and towns everywhere. “By comparison, we’re stuck with risibly third-rate trains, the poorest-quality long-distance rolling stock in Europe. “Our infrastructure creaks. When one of these outdated trains heading for the Central Belt approaches Stonehaven, it passes through three manually-controlled signals within 300 yards – the same kind of system that Queen Victoria saw 120 years ago. “So for a £200 million spend, we could save two minutes? I spent almost the same time digesting the clumsy title of the report – “Transport Scotland: Aberdeen-Central Belt Journey Time Improvements Opportunities Study”.